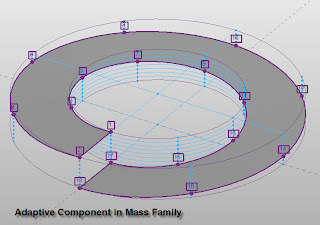 Today I saw a YouTube post by David Light Revit demonstrating how to create a Helix using Conceptual Masses and Adaptive components. I was intrigued because Helix shapes have been on the list of elements that people want to create but were unable or created difficulty when doing so. Particularly parking or other helical ramps that span multiple floors and needed to rotate around a concrete post or have open space in the middle. Using the floor tool we could Modify Sub-elements and set the points at the correct height for each space on the ramp and get a helix of sorts. However though geometrically correct it took a lot of time and tuning especially if the floor to floor heights changed or the ramp radius changed etc. Also users complained that the ramp either came out flat (side to side) or angled based on the curvature of the helix. Users want to set a basic side slope based on drainage or to intersect flat floors and could not easily do this. For those of you who have not seen nor explored these yet I will try to explain how they work. Adaptive Components are a series of points connected by lines or splines that are numbered in the order in which they are to be attached to another mass element. 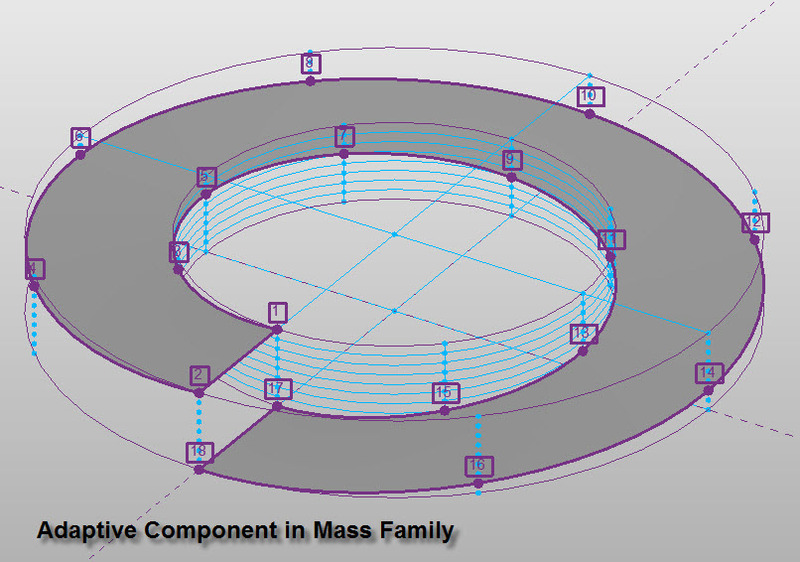 Setting the point order creates the shape when the component is attached to another mass. The mass needs to have sub-divided faces for the points in the component to attach. This seems pretty abstract but will become more clear as you watch David's video and see my explanation. David produces a spline sweep that curves around a cylinder reference at known intervals x,y,z to create a helix. The sweep he uses has single spline as the path and a circle as the profile creating a cylinder sweep in a helix. Cool but not really useful as the elements that can be attached to the sweep are limited to walls and floors. I took his a bit further and created a flat surface in the form of a helix. I can attach roofs or walls to that surface to create a helical surface that depends on the mass but can be viewed independently. Now you should watch David's Video for the basic understanding of how this is accomplished and I want to give proper credit for figuring this out. What I have done after that adds to the functionality of this procedure and gives users a dynamic mass element that can be used in multiple projects. Divided that new reference cylinder the same way (2x2 on the top 8x4 on the sides) turned on the Nodes to see each connection point. Still using H1 as the height between levels allows for this mass to adapt to different floor to floor heights. 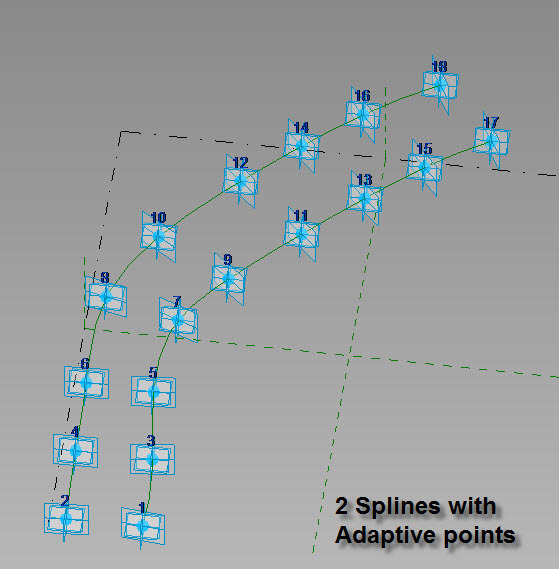 In my adaptive component I added a matching set of 9 points to the side of the previous 9 points. I lined them up visually to match the original shape. If you added the second set of points after you completed the first they may be mis-numbered. The order of the numbers should be set to the way you place the component in the mass. I chose to set each set inside first then outside. You could choose all inside then all outside or any other order you like but you must place them based on that order. Load the component in the mass family and place as noted in step 6 walking down and around the mass the same as in the video. When you are done you will have a helix flat surface that you can load into a project and attach a roof or walls to. The above image is a helix roof with standard walls below attached to the roof using standard Attach. The mass has R1 R2 and H1 to control outside, inside and floor to floor. Add H2 and assign to the inside cylinder and you can change the angle of the surface as well. Overall this takes less than an hour to create and can be used by multiple projects. 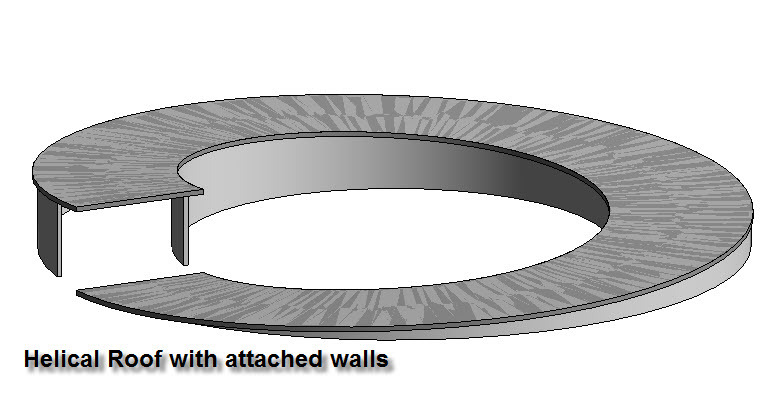 The technique can be evolved to other shapes if ellipses or rectangles are required for layout of the floor or ramp and walls below can be attached easily. 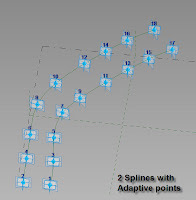 The component can be loaded into any preset mass family and controlled by any shape that has 18 nodes to align to. Model Reviewer was developed by Avatech, and Autodesk Reseller, and sold to Autodesk. It is now part of the Revit Advantage Pack and downloaded from users subscription page. There are a couple of parts to the model review software. The extension that is accessed inside Revit, Check files that store the checking rules, and Results files viewable inside Revit or using the Results viewer. Model Review must be installed inside of Revit as an extension. The installer generally handles this but I had a bit of difficulty and it took a couple of tries. Once installed the button appears on the Ribbon in the Add-Ins tab with it's own Panel Titled Model Review. There are 2 buttons that interact with the model review, Check and Manage. Check starts the checking process, asking for a check file and which model to check. The program can check the current file, current and linked, or all models in a folder. The Check File is set and configured using the Manage Button on the Ribbon. After choosing the Check File and Revit file(s) the process will begin. The program will step through all rules in the Check File for each model selected. This may take some time depending on number of models, number of rules and objects accessed by the rules. When the program is finished, it will display the results. The results are saved in the Model Review folder in My Documents. It will be titled .bcf. The results viewer can be opened separately from Revit to view results files. The Results viewer can also export the results to an html file available to your browser anywhere. However the html file is read only and does not interact with the model. The Manage button on the Ribbon opens the manage dialog. In this dialog users can create, edit, organize and delete Check Files. 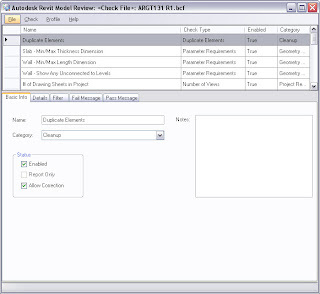 At the top of the dialog, the list of rules for the check file are listed. Users can manage the Check rules there. Selecting a check in the top opens up the options tabs on the lower portion of the dialog allowing users to set check options for each rule as well as change the name and description. There are 33 different check templates and many of those have numerous settings. We will be looking at different checks and properties in future blogs. The file menu allows users to open, save, save as.. and create new check files. Users can start with a predefined file, blank file or any file they open. Add or modify check rules for each file and save to the proper location. However if the files are not added to the profile they will not be available for checking a model. 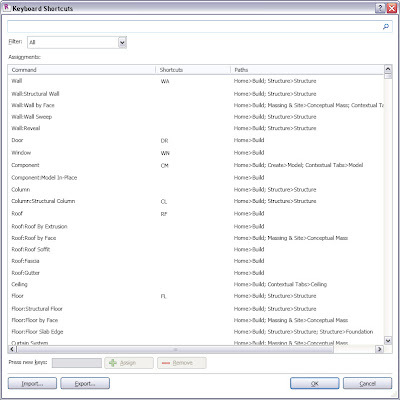 The profile menu allows users to choose which check files are listed in the Check Model dialog box. The standards tab contains the current files allowed for checking. Use the add button to add a new check file, edit to rename or repath a file, and delete to remove a file. The Folders tab changes where the results are stored as well and where any additional plugins can be found. There is currently one plugin to check for firewall/door ratings. I understand there will be more to follow and possibly 3rd party plugins as well. Once the profile s edited, save and open the check model dialog, select the check file and run the check. This week we will be reviewing the following rules: Family Size, Visibility, Parameters. For those users who have never worked Revit Structures these tools will be very new, but welcome. It users look to the new structural Tab they will see what appears to be some duplicate tools with a bit of a structural bent. In 2009 we had many of these tools which created similar elements to their architectural counterpart but with a few changes. This is still the case, but there is more control added to each structural element that was previously only available in Revit Structures. In Revit Architecture we could always see the deck profile settings, but since they were greyed out we could not do anything to make the change. I often would open the project in Structures to make those changes and load back to Architecture. Architects can now make those changes themselves. There are a couple of steps to get the deck profile to display in section or Elevation (Note section or elevation only) users need to load and assign a deck profile to your floor type. The advantage pack shipped with extra content that was installed in the default content location. Note: If you have moved the default content location you may need to download the content manualy and unzip. Only the new and update content is included. In the Floor Type properties, click the Structure Edit button to open the structure of the floor. Note below the floor layers are 2 combo boxes to control the deck layer. Select a Layer and change the function to Structural Deck  The combo boxes will then become active. Choose a deck profile, and whether or not it's standalone or part of the layer above. (Changes the overall thickness of the floor) Finish the type properties. Draw a new floor slab. If started from the Structural tab->Floor->Structural Floor the Structural parameter will be on. If started from Floor it will be off. Turning this parameter on and off will show and hide the structural deck in the floor. It is an instance parameter so each floor in question will need to be changed. First time users will probably get a warning when they create their first structural floor. The span direction annotation controls the direction of the deck so it displays correctly in section. Load this from (Library)/Imperial Library/Annotations/Structural/. After creating the structural floor attach the Span Direction Symbol. If you have canceled the command, the Span Direction Tool is on the Far right side of Annotation Tab. Rotate the symbol to alter the span direction of the metal deck. In section or elevation the deck profile will display if the View Detail Level is set to Medium or Higher and the Structural Parameter is turned on in the Instance properties. Revit Structures has had a truss tool for a couple of releases and now the Architecture has it as well. This tool has two parts, the Truss family template and the ability to place the truss in the model. The truss family template allows users to sketch a layout for the truss using top and bottom chords and web members. Users can assign structural framing shapes to each of the sketch members and assign parametrics to alter the size and shape of of the truss. Inside the project users can assign structural framing members to each of the sketch lines allowing for different members at the top and bottom chord and different web lines. Users can sketch a fast truss that can later be analytical to the structural engineer, or serve as a basis for their own truss design. Revit Architecture has been able to create the same beam systems as Revit structures for some time. However Architecture users could not tag the system with a span tag. Now users are able to tag your Beam Systems with a tag that reflects the member size and spacing. It will automatically adjust to cross the span and rotates with the Span of the system. Users can edit the tag to reflect firm standards. 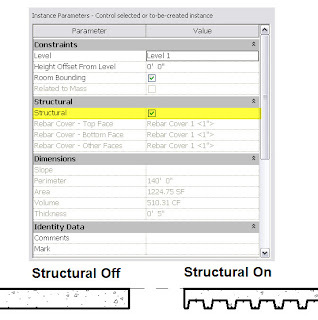 Architectural Users can now trim, cut and cope beams in Revit architecture. The cut tool now works with Reference planes and beams. Draw a new plane across a beam and use the cut tool. The beam will miter to the angle. Coping allows users to cope beams to other beams or columns as well as set the distance of the coping. Along with the new tools for Revit in the Advantage Pack, we now have the ability to edit the keyboard shortcuts directly in Revit, through a dialog box. They also take effect immediately without restarting Revit. This dialog is accessed through the options dialog on the Application menu (Big R button) It allows users to sort, filter and search for commands in various ways. I started by filtering by tab and setting the shortcuts for each one. After doing that I searched for my favorites to make sure I had them all filled out. I then turned on all commands, sorted by the Shortcut to assist with finding duplicates. It appears Revit will not log the duplicates as it did with earlier releases. I also exported the file to .xml and loaded it to Excel and Access. Both let me search quickly for duplicates and sort filter etc. Both methods seem to work so choose your best method. The dialog allows users to import and export their file to an .xml file for safekeeping or swapping with others. We tried this and it works great across multiple computers. However you still must send the file to each user, no common file to work off. When you installed the Advantage Pack, Revit reset your shortcuts back to the factory and there is no way we could find to use a 2009 or 2010 txt file to update the current shortcuts. So if you are like me and just got your shortcuts finally worked out for 2010 you will need to start over. However it promises to be much better in the future I hope. I later found there is a way to import your 2010 and 2009 shortcuts. It seems it misses some due to different command locations, but many are there. Good place to start. 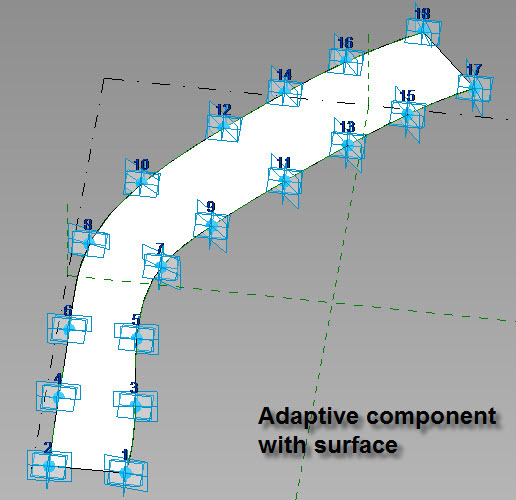 In the previous post I listed the new features added to Revit on the Advantage packs. Also added were some new extensions as well as new downloads. These extensions and downloads are available for all three Revit applications. Model review allows users to create a series of rules based on templates and run checks of your models for energy usage, Revit performance, and many other rule types. The rules are configurable, and can be saved as templates for future projects. DBLink allows users to create and maintain links to Databases from Revit. Image modeler is a tool to create 3D models from pictures. I do not know much more than that but we plan to check it out. All of the above tools are separate installations and do not come in any of the Advantage packs but are available on the subscription website. The good news is the update is a patch and series of extra plugins instead of a full install. The update also includes the SP1 and SP2 patches for Revit and the Autocad based update includes many patches and hotfixes. Today I am going to focus on the Revit platform and what changes were added to each one. We are going to start testing the features and writing about them here over the next few days. In my last post I discussed an owner looking at the BIM deliverable and having an issue with the software they were going to purchase to manage this model after completion. Many owners are looking at BIM right now and wondering about learning and managing the software tools necessary for BIM. We have even had owners say that buying or using Revit would make them architects and they do not want to become that. So, how do owners interact with the model and what do owners need to do? There are a number of activities that can assist building owners and managers that involve the BIM process. (Note I said process not software) First owners need to understand the process, deliverable and tools. After they understand much of that, they need to create a BIM standard. Many owners have begun this process (See list below) and have published some good but early BIM standards. These standards set both the design and construction processes as well as the final deliverable for the model and data. Many of these owners based these standards on their pilot BIM projects and set standards based on what worked for them and left out what did not work. Owners may not ever take over control of an entire model per say, but may require data to be delivered in a specified manner like COBIE or a format that works with the software they intend to use for management. This may even be 2D CAD with embedded data from the model. COBIE has begun to deal with the problem of owners receiving loads of data from the AEC team at the end of the project. They get all this paper and it takes months or years to sift through, file and update maintenance systems for the new air handler that is different than the previous model. Because of this set of tasks, many owners never get this completed and maintenance lags, equipment fails and need to be replaced. Using the model can assist in a couple of ways. First the data a model contains is much better than we were putting in our CAD drawings. Plus most owners did not have a method to extract the data from CAD because it is hard. BIM can create simple spreadsheet files of DATA that owners can use, or more complex databases for integration into existing systems. BIM also allows users to explore the building in 3D as a single unit rather than flip through drawings, layers and files. Locating the main trunk line to reset an air senor is much faster and easier with BIM. Plus they have a complete inventory of the building ready for reporting to agencies and future designers and contractors. However BIM models are also large and complex animals. How does an owner understand what is there and how accurate the information is? They all need to be using a BIM checking software like Solibri or Navisworks to get reports to determine the accuracy of the data. Accepting a BIM model without checking will just open them to problems later either with remodels or maintenance. Owners should be asking for interim submittals where they check the models for compliance to both their standard and accuracy.